The New York Knicks continue to win, beating the Phoenix Suns 98-96 in overtime. A lot has to do with Carmelo Anthony leading them in the finish, as expected, but in general, as in previous wins, the effort and defense that were nonexistent previously this season made most of the difference. 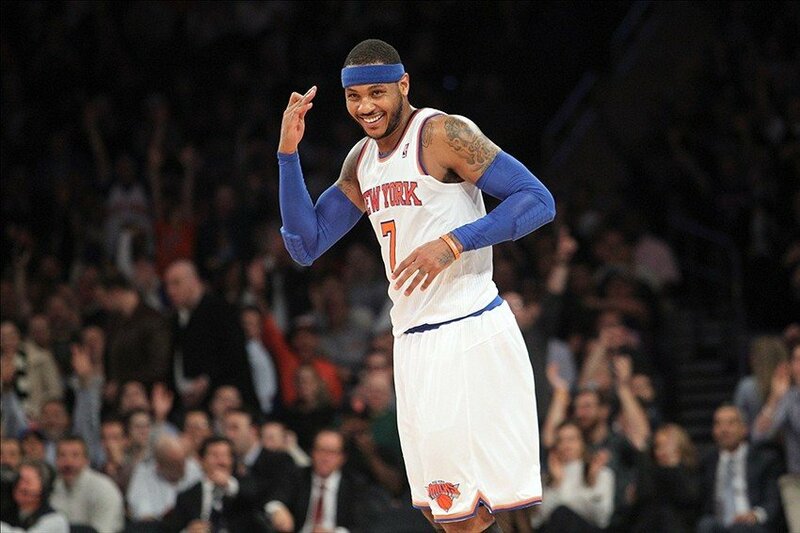 Anthony finished with 29 points and 16 rebounds, leading the Knicks in both categories. It wasn’t even close to being an accurate shooting day from him as the Knicks’ offense once again had that labored, selfish, one directional look about them which meant Anthony needed 24 shots to get his numbers, but he did score four points out of the total six for the Knicks in overtime and played a big enough part on defense to make a difference. The Suns are struggling without Eric Bledsoe, and their shooting was awful, with or without the Knicks having something to do with it. They shot 35.5% from the field, and it was especially horrendous coming from Goran Dragic (9-of-22), Channing Frye (3-of-12) but no one did worse than Gerald Green, finishing with 2-of-16 from the field and 0-of-7 from beyond the arc, which didn’t stop him from shooting and shooting again and again. According to Jeff Hornacek, fatigue might have had plenty to do with the Suns looking so bad. For the fifth game in seven nights against a team that’s playing well. I thought they gave a heck of an effort. We didn’t make shots. Don’t know if it’s because it’s the end of the trip. The Knicks didn’t really care about fatigue or anything of the sort. After such an awful start to the season, the Knicks have won five straight games, putting them at 8th in the Eastern conference, tied with the Brooklyn Nets but leading in the tiebreakers which are meaningless at the moment. There was more than just Anthony, obviously. Raymond Felton has been a big part of the Knicks looking much better and he put in his best performance this season, scoring 19 points on 8-of-16 from the field. He had only on assist and the Knicks in general played something quite opposite from team basketball on offense, but it’s less of a mess when players are covering for each other and there’s defense to cover up for misses and mistakes. Kenyon Martin continues to do a great job instead of Tyson Chandler, finishing with 8 points, 9 rebounds (4 of them on offense) and probably being the glue that makes everything seem so good at the moment. J.R. Smith, out of the freezer again, added 11 points off the bench in a decent shooting night from him, although the Suns were enjoying the moments when the starting players weren’t on the floor. The Knicks aren’t going to challenge for the Eastern title like some would have hoped when this season began (also overreaching), but even without Chandler, they seem to have gotten over the most desperate times they’ve had under Mike Woodson. The cliche of becoming stronger fits this time, as the Knicks suddenly look like a team that as long as it doesn’t fall back into clinical depression, have what it takes to make the playoffs, and just from the 8th spot. I think now as a team, I think mentally we’re a different type of team. I think now we’re starting to believe that when we do get down, we still have a chance to win the basketball game.